Reviews | Regal Gourmet Peppercorn Medley - 8 oz. This colorful Regal peppercorn medley is especially attractive in clear acrylic peppermills. Serving whole peppercorns, rather than table grind pepper, lends an upscale look to your tabletop display. When used with pepper grinders or mills, your freshly-ground product will have a robust, fresh taste. We got this out of curiosity never tried the blend before. Well it is AWESOME!!! the flavor it gives your food more than ordinary. very impressed with the flavor and value. It's a keeper!!! An excellent Peppercorn Medley, by Regal. A very versatile product, with an extended shelf life. A reasonable price for a Gourmet taste. Perfect for a gift bag. I love this pepper corn medley. The variety of pepper cons adds a more interesting flavor. High quality, fresh product. I would happily order again. The peppercorns itself are great. I didn't realize that it has proposition 65 warning. The website mentions it. Probably due to BPA can? I transferred the contents to a glass jar. A great value for a peppercorn medley. I usually pay more in local stores for all black peppercorns and at that...get a lesser amount. Fresh and full of flavor! Hard to find this in stores...even restaurant supply stores. So nice to find this medley on this site. Good price, good flavor. Great for home use if you go through a lot of pepper for your mill, buy this size. It won't go to waste. I really like the gourmet peppercorn medley, I grind it in a small coffee grinder and used it with kosher salt for our burgers add great flavor without overpowering the burger. This is a great medley that produces a nice smoky, earthy balance of different peppercorns. I love having these on hand to use in my mortar and pestle. This is a very colorful blend, that i like ti mix with a cheaper yellow corn. You are able to see a slight difference in the popped corn. People like it when they can see the color before hand. I display some kernels in a mason jar. When I ordered the peppercorn Medley I really didnt know what I would get. I love the pink peppercorns but they can really get expensive so I was really happy to see the Peppercorns by Regal spice. They were very fresh and aromatic. Im actually going to replace my black peppercorns with the medley. A great peppercorn medley that is so fresh and adds a great strong pepper taste to our dishes. Great for grinding our using for the whole peppercorns. A nice fancy blend of peppercorn medley that is great for our grinders. The flavor is great and makes a great seasoning for our sauces. This Regal gourmet peppercorn medley has the best flavor and smell. Always so fresh when i purchase. I also love the color variation that this medley offers. The regal gourmet peppercorn medley is a great mixture of different peppers that is perfect for making our peppercorn crusted steak. The peppers blend well together and work well with our grinder. A nice buy. Great peppercorn medley. Perfect balance of the different peppercorns. Grinds nice and easy, no chunks. This did not gunk up the grinder at all. Fresh tasting. I received this peppercorn for use on my brisket, cooked this weekend and got so many raves about it with 3 more events to cater!! If anyone is curious it grinds down to 2 cups every 8 oz. I love this peppercorn medly. I honestly do bot have enough knowledge to name them all but I know there is pink peppercorns inside and the finished product tastes incredible. These peppercorns are a great change of pace from the usual black peppercorn. When used as a garnish, they enhance the appearance as well as the taste. Great item. This peppercorn medley is fantastic. Fresh spices always have the most aroma and flavor and these will not let you down. Perfect blend for the pepper mill. Love the flavor of this peppercorns. Adds a vibrant color on pasta dish and sauces. Perfect to for pepper grinder and as garnish too. Try it! Best choice for your pepper mill! Delicious combination of black, white, green and red pepper make this product a hero for any gourmet! Great price too! peppercorns are good to use and sometimes as a sub for the common black pepper. They come in different varieties so it can be hard to know which to use. This blended combo makes it easy and each compliments the other. Maybe it was a bad batch I got but I got about 95% black peppercorns. Not bad for the price, I was just looking for more eye appeal. Flavor seemed to be just fine. We appreciate your review, Joel. We wish these peppercorns would have worked out for you. Our Customer Solutions team will remain in contact with you about this. This is one of our favorite pepper combinations. We use it in a pepper grinder that is clear and it shows off the colors beautifully. Our people love to use it not only for the taste but the visual. This gourmet peppercorn medley is just as good as the pricier, name brand gourmet peppercorn medley, at a fraction of the cost. I will absolutely be buying all of my dried herbs and spices through Websturant Store from now on. I love peppercorn medley for the different flavors. And know I'll be using it more that I have found a excellent price. Thank you WEBstaurant Store for the price of the item. And I will definitely purchase more when I need it. Excellent peppercorns! take your steak out of the fridge 2 hours before you want to grill it, use these gourmet peppercorns, don't be shy! The best steak ever! 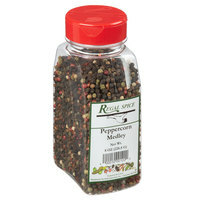 The Regal Gourmet Peppercorn Medley has a very good taste and flavor. I highly recommend using these peppercorns for your salads & cooking. Thank you. Another no brainer! You cannot buy this quantity of peppercorns for this price anywhere else that I have found. The peppercorn medley is what we use the most because of the mix of different peppers. We love this product and will continue to purchase from Webstaurant. Unscrew the plastic lid and peel off the paper/foil seal. You'll hear the whish of the vacuum seal breaking. And then...the wonderful aroma of fresh pepper. A colorful assortment in this medley, and lots of flavor in these fresh ground peppercorns! This is a generous amount at a reasonable price and will keep my pepper mill full for quite a while. I used to just purchase plain black peppercorns for my grinder at home, because the medly is so expensive in stores. With a great price here, I am once again able to stock up on this product. As other reviewers state, it looks great in a clear pepper mill. These look great in my acrylic pepper grinder and my guests loves the taste. I am glad to have this gourmet variety at such a great price. A wonderful mix of peppercorns and well priced. As a personal preference I mixed 8oz Medley peppercorns with 8oz black peppercorns for a custom blend. As always Webstaurant has easy ordering and fast shipping with great prices. What a great deal! the price is reasonably cheap. I agree that using an acrylic pepper mill definitely created a better appearance for the peppers. I bought these along with the clear pepper mill that they sell and I am very pleased, they look nice in the grinder and they taste good too! These peppercorns offer an excellent snap to foods. Pepper is a staple in several of our lunch dished and this, being unground, are perfect for adding to all kinds of foods.